Conrad Dublin Hotel in Dublin. 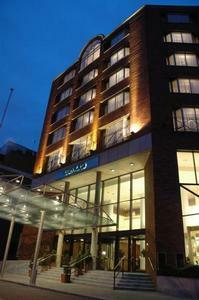 Hotel in Dublin City, Dublin. Luxury 5 star Hotel. Welcome to the Conrad Dublin Hotel in Dublin. This 5-star luxury hotel is in Dublin city centre, opposite the National Concert Hall and 600 metres from the shops of Grafton Street. It has air-conditioned rooms, a restaurant and 2 bars. For more information or to check the availability of this Hotel in Dublin please click on the availability link above and below. The Conrad Dublin is in Dublin, Ireland. The address is Earlsfort Terrace, Dublin.